Trying to raise my kids the best I can: How will you be remembered? I was inspired by this obituary I read today about Clara Fox. 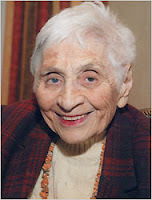 She was an advocate for subsidized housing for poor and moderate income people. She made a big difference in her 90 years. I'm not saying that you have to start some huge organization to have made an impact in this world. Surely raising my kids well will impact this world for the better. But I would like to eventually take on some social ill, like Clara did, and pour my energy into it enough that something changes.